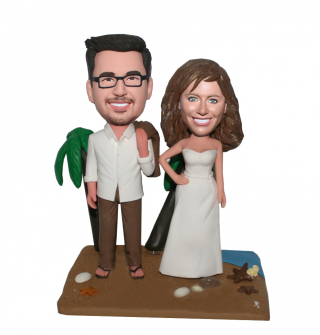 The custom couple bobblehead doll depicts the bride is wearing her casual beach wedding dress, and the groom has his linen suit jacket draped over his shoulder.This customized bobblehead is an ideal gift for yourself and your lover, to show how sweet you marriage is. Also ideal to bless the couple you appreciate. Don't forget that our talented artists are blessing you, too!